Good for wedding, party, prom or banquet. The delicate rhinestone and pearl brings you uniqueness sense of beauty. A beautiful and versatile accessory for the whole year. Otherwise deal is final. Great to match any style. Captain Marvel Shirt Pin / Patch. Up for sale is a Wonder Woman Tiara. 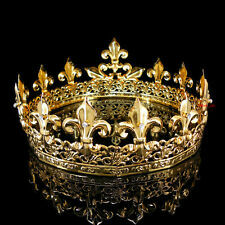 Include: 1 crown. Your recognition will encourage us greatly and serve you better. Used by Traditional Thai Dancers during their theatrical performances, can also be used for Weddings or any special occasions. Handmade from Leather, colored threads, beads, sequins and gilt gold foil. The Kra-Bung is a barrier in Thai language and Nga is a face. We can call it as Thai Ancient Tiara, also. It is used in "Srivichai Dance" and also applied to other Thai Traditional dresses. (Foldable Wire Structure). Bride to Be Tiara with Veil. We will always strive to solve any issues you may have. White, with Pink Lettering. 60s, 70s and 80s. 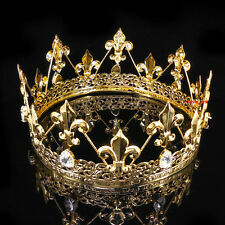 This spectacular Crown Designed as headband very comfortable to wear fit toddler, Children and Adults. We strive for 5-star service by providing high-quality goods and perfect service. KIDS Heart Flower Pearl Butterfly Side Tiara Full Crystal Snowflakes Little Ceramic Wavy. Purple Blue Golden Pink Red Green Royal Blue Baby Pink Large Beads Leaf. 8.5cm (3.4") High. Gem Type: Austrian Crystal. Simply stunning! You are looking at gorgeous vines rhinestone tiara crown. All rhinestones shines a lot! This tiara is perfect for prom, party or any special occasions. Center section is approx. Tiara is approx. Simply stunning! You are looking at gorgeous phoenixtiara crown. All the clear beads are stringed on top by hand. All rhinestones shines a lot! This tiara is perfect for prom, party or any special occasions. It is made by Leather and Jewelries. You are looking at gorgeous Cz stone & Austrian rhinestone tiara crown. All Cz stones & rhinestones shine a lot! This tiara is perfect for wedding, party, prom, pageant or any special occasions! Center section is approx. Handmade spiked skull leather and steel crown. They have turned into hungrier money grubbing leeches than ever before witnessed. • Make sure item is exactly what you want. Great for any aspirational queen or princess, this golden crown features a centered, faceted, oval red ruby inserted on the crown's front. Bend the golden headband inward and outward to adjust to each individual's head size. Im Originalkarton um 1930. Karton mit Gebrauchsspuren! Alloy Wreath Hair Band Lord King Headpiece. Material: Alloy. High quality in EU and US quality standard. It may be longer. the picture may not reflect the actual color of the item. hope you will wait for item Patiently!